When I was a teenage punter - not so much a betting man as a betting boy - it would probably have seemed strange to me that at Cheltenham time, a top jockey would be doing ads for a top bookie like Terry Rogers or Sean Graham. And however strange it would have seemed to me back then, I imagine it could have been a cause of deep emotion on the part of the more seasoned punters, if that top jockey had perhaps disappointed them in some aspect of his race-riding. To their chagrin at being losers would have been added even more chagrin at the jockey's association with the winners in the betting ring, so much chagrin indeed, we can only give thanks that such things didn't happen in that simpler time - and yet it's happening now, in lavish style, and some of us hardly even notice it. Somewhere in our heads there is still this strict separation between us (the punters) and them (the bookies), and yet until recently it hardly registered, with me at least, that Ruby Walsh is representing both "us" when he rides the horses, and "them" in the advertising. Which is a tribute to the popularity and to the integrity of Ruby Walsh, this fact that so many of us just regard his Paddy Power ads as a form of promotion for the game in general - conveying this sense of an industry in which everyone is pulling in the same direction, the runners and riders and the backers and the layers. But it is also a tribute to the genius of the corporations, that they can create that impression, because, of course, the backers and the layers are not actually pulling in the same direction here. 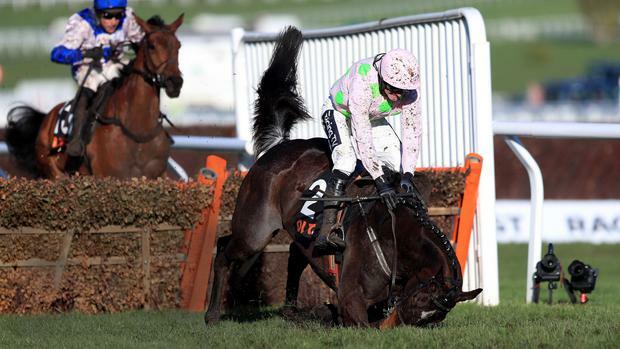 Indeed when Ruby fell at the last fence on Benie des Dieux, his "banker" of the meeting, the owner Rich Ricci (for it is he) explicitly called on the "trolls" to leave the great man alone, and not to repeat the abuse he received when Annie Power also fell at the last in 2015. In that moment, the "trolls" could only see Ruby as the bookie's pal, playing his part with Paddy Power in the ads, forgetting that he had also been the punter's pal on countless occasions. So perhaps this would be a good time for Ruby to step back, as they say, from this advertising game. Betting may be inextricably linked with horse-racing, but it is now inextricably linked with football too, and it would not be a good look if, say, Harry Kane became the public face of Ladbrokes, even if he was only having a laugh - you're more likely to have a retired old pro like Sky pundit Paul Merson, who has done gambling ads, though he spoke last week about his addiction being out of control again. A current star of the Premier League may have the name of a betting company across his shirt, his club can have an "official betting partner", but still it would look strange for a top player himself to be front and centre, and it mightn't even be allowed. Because they have this thing called the Advertising Standards Authority, which last week banned an ad for Skybet featuring Paul Merson's colleague, the great Sky presenter Jeff Stelling - it was decided that the use of Stelling, famed for his knowledge and expertise, "gave an erroneous impression of the extent of a gambler's control over betting success". They do that kind of thing in England sometimes, they have these "watchdogs" on the case, and even the odd rule or regulation - but of course, we don't really go in for any of that here. So it's entirely up to Ruby himself whether he wants to associate his magnificence with the company which used the image of Ole Gunnar Solskjaer recently, without his permission, leading the Gunnar to declare that "they are going to have a big, big problem with me… if there's anything I should not have anything to do with, it is a betting company". But then maybe I'm asking too much - I have noted that betting corporations are churning out the odds on all varieties of Brexit, but that when I wrote in 2016 that "there will be no Brexit", favouring instead the No Brexit Brexit, I couldn't find odds on that anywhere, even from Paddy Power. And the reason I couldn't find any odds on that anywhere is that there were none, anywhere. Because nobody in the entire world had apparently considered that possibility… nobody that is, apart from me. So I feel a bit like one of those lads they put in the paper holding up the docket which won him 150 grand for a 50 cents accumulator - except without the 150 grand. But if they want to use my image, I'm sure we can come to some arrangement. There was a vote in the House of Commons last week that had a majority of four. Sinn Fein has seven MPs - yet one of the several dubious explanations for their abstentionism is a claim on their part that even if they took their seats, it would make no difference anyway. And sure, at that rate, you might ask what's the point of this politics thing at all, or indeed, of life in general? So I was having a look at the ad for Brady's ham that has them doing their hammy take on Come out ye Black and Tans, and while it is rollicking stuff, I still felt that it's not there that we should be looking for the real signs of the resurgence of nationalist eejitry. The true source is that remarkable free pass that Sinn Fein has been given on their refusal to do something - anything - that might help Ireland at this difficult time at Westminster. And it's remarkable not just for Sinn Fein's bogus reasoning, but because at times the bogus reasoning has actually been done for them by others, some of whom call themselves "journalists". I have heard these people dismiss any pressure on Sinn Fein in this area with the weary air of sophisticates who can hardly be bothered to put into words their disdain for those who can't seem to get it into their heads that abstentionism was in the Sinn Fein manifesto and everybody who voted for them understood their position on it. Right. So by the same token, everyone knew that Trump wanted his Wall, and he got elected - so there's no point arguing about that, is there? Likewise David Cameron had the Brexit Referendum in his manifesto, so how can you find fault with the man for going through with it? Fianna Fail or indeed any "normal" party would be slaughtered if they were sitting at home pontificating when they could be making a difference on Brexit, regardless of what they promised their followers in some manifesto that nobody read anyway. Yet Sinn Fein sails on, untroubled by hard questions, or even easy ones. As a nationalist party, they are not even asked about the plague of nationalism which is causing so much grief in other countries - but to which we are apparently immune. Except we are not. And we are hearing it all the time now, in this constant whining about the Brits and the awesome scale of their foolishness. Which is a true thing, but here is another true thing: there's this Irish party with seven wasted votes at Westminster at a time when four can constitute a majority, and nobody even mentions it any more. You may have heard Ultan Conlon, from Loughrea, Co Galway, and his band The Night Owls recently on the Sean O'Rourke radio show, performing his single In The Blink Of An Eye, or duetting A Weak Heart Like Mine with Mary Coughlan on the Ray D'Arcy TV show - but it's his collaboration with the late John Martyn that is perhaps most intriguing. I didn't know about this until the other day. Hardly anybody knows about it really, but it's very interesting, in a good way. And the fact that hardly anybody knows about it is itself very interesting, in a bad way. Martyn, whose legend is growing all the time, played the Cork Opera House in 2005, supported by the Galway band Ultan John - the Ultan part of which had written this song called Really Gone, which he presented to Martyn as part of a seven-song demo tape. Martyn, who lived the final years of his life in Thomastown, Co Kilkenny, contacted Conlon to say he wanted to record "the country one" which was Really Gone, in a duet with Ultan John, and so it happened. It's on YouTube and it's very good. Even better it was written by Conlon when he was 17. That would be John Martyn whose own songs generally served him well enough (though I do recall him having a crack at Somewhere Over the Rainbow - with Martyn, it was always a high bar). So here's the thing: there are probably thousands of entertainers in this country that I know something about, who have been put in front of us for whatever reason, and yet here's a chap who had a song that he wrote when he was 17 recorded by John Bloody Martyn - and there's hardly a soul knows about any of it. Recently in the world, an act of cynicism went unrewarded by the baleful gods. Indeed, not only was it unrewarded by them, it was punished. Which these days is unusual, bordering on the unnatural. The notorious Real Madrid captain Sergio Ramos, last seen by many of us "doing" Mo Salah in the Champions League final, had admitted to deliberately - cynically, indeed - getting himself booked in the first leg of their tie against Ajax, on the assumption that he wouldn't be needed for the second leg. This was all done so he could serve his suspension - and be card-free for the next round. It was Grade A cynicism, so pure that the man even admitted it, as if he couldn't help showing off his mastery of cynicism, flaunting his prowess as the cynic's cynic, the cynic that other cynics call El Cynico. Except it didn't work - during the second leg, Ramos had to sit in his executive box, powerless to intervene as Ajax tore his boys apart. Still high on the improbability of it all.